Spoiler Warning: Some stuff gets spoiled, y’all. Well it’s been at least two weeks since I finished Red Dead Redemption 2 and I’m almost emotionally recovered. After a slow warm up to, ahem, the redemption of Arthur Morgan, I was won over by some late stage developments in the game’s third act and now, with his death, I find myself a little emotionally deflated. I guess I got attached to that old persnickety outlaw, despite his many shortcomings. Maybe in identifying with his gruff but genuine desire for self improvement, over the course of his journey, I found something in him worth saving. 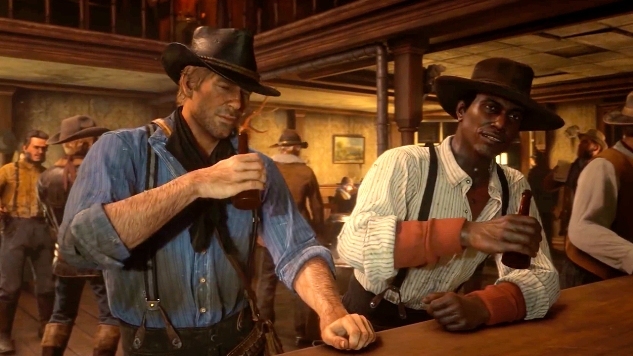 As I’ve grieved the character while finishing up the game (through its lengthy epilogue, which stars John Marston), I noticed it was no longer as fun as it used to be. Visiting familiar places and seeing the spots I used to cross many times as Arthur just made me sad. Whereas once a nice gallop across the plains was a relaxing part of each post-mission cool down, I could only think of all the times I’d done so with Arthur, as his final words and moments rang through my head. I wasn’t ready yet to pretend like nothing had happened. I’ve always been a little prone to player revisionism, even as a child when I would mentally rewrite the details of my favorite books to “erase” bad endings. There’s a certain appeal to the redemption of videogames, how they let us “do over” in a way that real life just doesn’t. In videogames, just because something terrible happens doesn’t mean it stays that way. You get to try again. As I’ve written before, this is especially true with games like The Legend of Zelda: Majora’s Mask, which uses a repeatable three day cycle that replays quests and missions several times in order to fully progress, and Life is Strange, which focuses heavily on consequence and features a myriad of twists and turns based on the minutiae of what the player decides. In both games, there comes the question of what choices you might make if you were given another chance. That question also arrives in Red Dead Redemption 2, but without any real means to change the past. In Majora’s Mask I could restart the three day cycle with new information, and in Life is Strange I could use Max’s rewind power to quickly fix a conversational faux pas. Worst case scenario, I could always go back to an earlier save file if I needed to, and start over fresh. But with Arthur Morgan, there’s no going back on the many sins committed and mistakes made. There’s no changing his fate. It’s good, in this case, that there’s no going back, in the sense that Arthur Morgan, despite his occasional dips into heroic behavior, is not a good man. It is sheer poetic justice that the illness that claims his life was caught in the course of beating a sick man to death over a debt. He does not, as he says many times to Mrs. Downes and her son, the family of his victim, seek forgiveness. He has accepted his fate, physically and spiritually, even if it is difficult for the player to do so too. Before that key moment in the game, where I flinched and debated but ultimately beat that poor man to death, I’d been enjoying the outlaw life. The best parts of the game are before anything substantial in the main questline happens. I avoided the stagecoach robbery missions and I refused to rob or even insult the NPCs, spending my days hunting and fishing and trotting my horse from the mountains to the bayou, picking orchids or looking for dinosaur bones instead of acting out a Wild West fantasy. If I’d known there would come a time when Dutch would succumb to his grief and paranoia, when the gang would all be fighting, that rolling into camp on horseback would elicit silence instead of a hearty welcome home, I’d probably have stayed forever in that weird little slice of virtual heaven. Arthur would never die, Dutch wouldn’t run the gang into the ground, and I’d never end up passing through Big Valley on John Marston’s horse wondering where it all went wrong. I admit I want to go back to when Arthur was healthy, when the gang was happy, and I spent most days just hunting and fishing. I can’t bear to think of finishing the Compendium and all the game challenges as John Marston instead of Arthur. I want to ride into camp and hear Karen say howdy, do some chores in the sunlight and bicker with the boys over a plate of stew. But it’s different now. Even if I were to start a fresh file and spend all of my time in a happy purgatory of non-progression, I’d still know what happens later on. It’s not like with Life is Strange, where a changed decision ripples through the entire storyline, or Majora’s Mask, where I can rewind time and try again. I can’t get those days back. I can avoid those Leopold Strauss missions all I want, but it won’t change the fact that Arthur has to die. I just wish I’d known they were the good times before they were gone.